If several decoders are used it can be good to avoid the need for several power supplies. This card uses 12 volt dc and provides several connections for 5 volt. The conversion to 5 volt is done with so called switched technology, which means small power losses. Several cards can be connected together to a common power supply. In modular railroading, this gives the opportunity to allow a station consisting of several section, to user power from one common supply. Cards can be connected together by a specific power connection, or by a LocoNet cable. Note - if the LocoNet used will have a central command station connected, then power must not be distributed through the LocoNet cable!. In the following picture, 3 distribution cards are connected together through the LocoNet cable. One of the cards has a 12 volt power supply connected. Note that the "LocoNet termination card", top left, is connected without its own power supply and instead takes power needed from LocoNet. 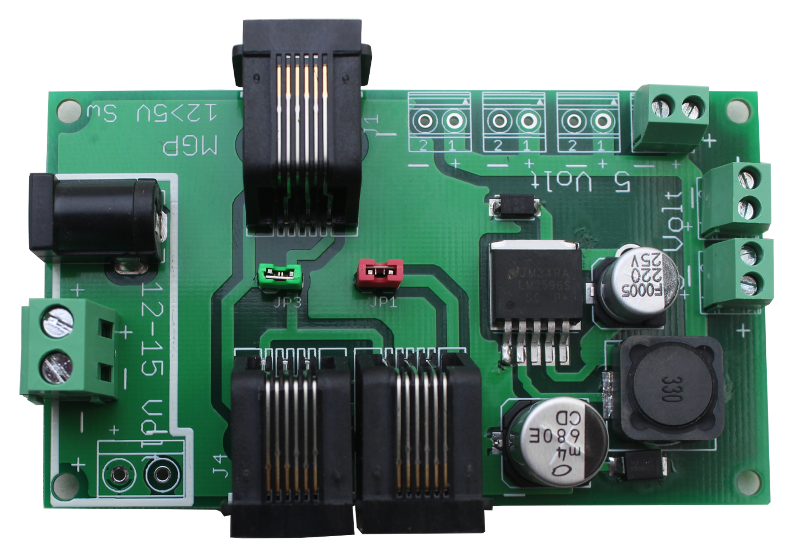 The card is equipped with one screw terminal and a dc connection (5.5/2.1) for 12 volt, and 3 screw terminals for 5 volt. This can be expanded with 1 extra connection for 12 volt and 3 more for 5 volt. The card is delivered without power supply.